DROP-INS Holes Punched 4” O.C. For Faucet Hole Revision Order K-472 $115. Cut-Out Size Requires 1-1/4” Radius Corners. Maximum Counter Thickness Is 2”. INCLUDES K-50 LEAD FREE COMPLIANT FAUCET & BASKET DRAIN (To delete faucet, order K-50OMIT and deduct $22)   D ro p-In Sin ks TWO COMPARTMENT Countertop Mounted, Self Rim Design THREE COMPARTMENT Countertop Mounted, Self Rim Design DI-3-10 $1817 10” x 14” x 10” Bowl Overall: 38” x 19” Cut-out: 37 1/4” x 18 1/4” 34 lbs. 5 cu. ft. 20 gauge DI-3-1410 $2433 16” x 14” x 10” Bowl Overall: 50” x 21” Cut-out: 49 1/4” x 20 1/4” 38 lbs. 8 cu. ft. 18 gauge DI-3-1612 $2741 16” x 20” x 12” Bowl Overall: 56” x 25” Cut-out: 55 1/4” x 24 1/4” 60 lbs. 12 cu. ft. 18 gauge Includes a K-53 Faucet. To delete, order K-53OMIT & deduct $22 = Ship Via UPS     DI-2-10 $1187 10” x 14” x 10” Bowl Overall: 25 1/2” x 19” Cut-out: 24 3/4” x 18 1/4” 26 lbs. 4 cu. ft. 20 gauge DI-2-1410 $1806 14” x 16” x 10” Bowl Overall: 33 1/2” x 21” Cut-out: 32 3/4” x 20 1/4” 35 lbs. 6 cu. ft. 18 gauge DI-2-2012 $1890 20” x 16” x 12” Bowl Overall: 45 1/2” x 21” Cut-out: 44 3/4” x 20 1/4” 42 lbs. 9 cu. ft. 18 gauge DI-2-208 $1477 20” x 16” x 8” Bowl Overall: 45 1/2” x 21” Cut-out: 44 3/4” x 20 1/4” 40 lbs. 6 cu. ft. 18 gauge       DID YOU KNOW? 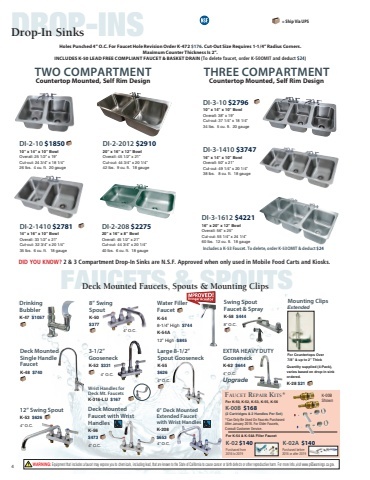 2 & 3 Compartment Drop-In Sinks are N.S.F. Approved when only used in Mobile Food Carts and Kiosks. Deck Mounted Faucets, Spouts & Mounting Clips Drinking Bubbler K-47 $687 Deck Mounted Single Handle Faucet K-48 $481 12” Swing Spout K-53 $407 4” O.C. 8” Swing Spout K-50 $233 3-1/2” Gooseneck K-52 $210 Wrist Handles for Deck Mt. Faucets K-316-LU $109 Deck Mounted Faucet with Wrist Handles K-56 $307 4” O.C. Water Filler Faucet K-54 Swing Spout Faucet & Spray K-58 $289 8” O.C. EXTRA HEAVY DUTY Gooseneck K-62 $418 4” O.C. Upgrade Mounting Clips Extended For Countertops Over 7/8” & up to 2” Thick Quantity supplied (4-Pack), varies based on drop-in sink ordered. FAUCETS & SPOUTS        Acrylic 12” High $549 Arm 8-1/4” High $446 K-54A Lever      4” O.C. Large 8-1/2” Spout Gooseneck K-55 $407 4” O.C. 6” Deck Mounted Extended Faucet with Wrist Handles K-208 $424 4” O.C. K-28 $13 REpLACEmENT     CARTRidgES* For K-50, K-52, K-53, K-55, K-56 K-00B $98 (Set of 2) For K-54 & K-54A Filler Faucet K-02 $52 K-00HB Shown        *Can Only Be Used On Faucets Purchased After January 2016. For Older Faucets, Consult Customer Service. 4 WARNING: Equipment that includes a faucet may expose you to chemicals, including lead, that are known to the State of California to cause cancer or birth defects or other reproductive harm. For more Info.,visit www.p65warnings.ca.gov.